If you’re interested in taking pictures that really encapsulate the essence and beauty of your subject, you might want to check out some telephoto lenses. Designed to capture a narrow field of view while magnifying your subject, telephoto lenses are great for portraiture and still life photography. Strictly speaking, to qualify as a telephoto lens, a lens needs to have a focal length that measures between 70mm-300mm. But the best of them often fall along the 85mm range because it’s at this range that you can get the very best results. In this article we will be looking at the best 85mm lens for canon. Looking for the best 85mm lens for your Canon camera? We might be able to help you out. Find out which telephoto lens you should invest in by reading through our comprehensive review of the 5 best 85mm lenses for your Canon DSLR. The first lens in our search for the best 85mm lens for canon is the Canon EF 85mm f/1.8 USM Medium Telephoto Lens. This particular attachment has been tried and tested by literally thousands of buyers around the globe, and is often considered the ultimate go-to if you’re looking for a reliable and high quality telephoto lens. This prime lens features an aperture of f/1.8 which is highly efficient at capturing just enough light. This makes it possible for the lens to pick up on more detail even in low light shooting conditions. This pick from Canon also boasts a ring-type ultra-sonic monitor which basically helps the lens focus a lot faster so you don’t need to stand and wait for it to lock in on the right subject. For that reason, it’s also a great selection if you want to be able to take high quality images without spending too much time trying to perfect the shot. Finally, the Canon EF 85mm f/1.8 USM Medium Telephoto Lens is a premium choice because of its ability to create stunning contrast between your subject and out-of-focus areas. The lens generates the perfect bokeh, which is ideal for adding drama and depth to your captures for professional outcomes with each shot. This is why we feel this is one of the best 85mm lens for canon cameras. Prime lens means image quality is not sacrificed, letting you generate ultra high resolution images with minimal noise, distortion, and aberration. Features an aperture of f/1.8, allowing the lens to capture lots of light for well-lit images even in dark, difficult shooting conditions. Ring-type ultra-sonic monitor lets you focus on your target with increased speed and precision so you don’t need to wait around for your lens to adjust to the environment. Creates beautiful bokeh that adds depth and drama to all of your images, making them exceptionally professional in terms of aesthetic. Durable and burly, enabling you to use the device with confidence knowing it won’t give up on you shortly after breaking it out of the box. The lens is pretty heavy, so it might not be the most convenient to bring around. Looking for a budget friendly lens for your Canon camera? Well, you’re in luck. The Rokinon brand of camera lenses and accessories is a popular third-party brand that develops and designs some pretty sweet picks that maximize quality without weighing too hard on your pocket. On our list of the best 85mm lens for Canon, we’ve chosen the Rokinon 85M-C 85mm f/1.4 Aspherical Fixed Lens as our second best choice. This budget-friendly lens features some pretty impressive designs that make it a suitable choice despite its low cost. The lens uses an aspherical element which efficiently corrects spherical aberration. In lay man’s terms, this simply means that the lens was designed to reflect images and proportions as they are so you don’t end up with distorted subjects or edges, as is common with non-aspherical lenses. What’s more, the lens is a prime lens. While this doesn’t allow zooming in and out, it does improve overall image quality so you can be sure that you’re getting the highest possible resolution and sharpness with each shot that you take. Lastly, we want to talk about how the lens boasts an ultra robust body that’s perfect for using on the daily. 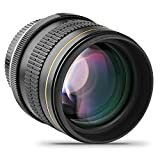 So being that it is so affordable and durable, it makes a great choice if you’re looking for a lens that you can use for everyday shooting without worrying about damage. This is why we feel this is one of the best 85mm lens for canon cameras. One of the most affordable telephoto lenses on the list, making it a suitable choice if you want a quality device that won’t weigh too hard on your budget. Aspherical lens shape reduces the chances of having parts of your image distorted by spherical aberration. So proportions are properly maintained from any vantage point or angle. Prime lens design optimizes sharpness and detail to give you high quality images that require little effort. Robust build and construction effectively keeps out dust and contaminants to keep your lens in top condition even after years of use. Another great lens for those in search of the best 85mm lens for Canon cameras is the Canon EF 24-85mm f/3.5-4.5 USM Standard Zoom Lens. Unlike the previous lenses on our list, this particular option is a zoom lens which means it features a focal range that you can search through to achieve different results with your images. This gives it greater versatility compared to a prime lens, but then again, sacrifices a little sharpness. The Canon EF 24-85mm f/3.5-4.5 USM Standard Zoom Lens can operate as a standard lens or a telephoto lens, thanks to its focal range that spans from 24mm to 85mm. This unlocks greater possibilities, allowing you to take more than just portraits and still life images with your camera. For the most part, the standard lens range is ideal for quick shots, enabling you to use your camera as a high-quality point and shoot for a variety of shooting conditions. Some other notable features of the Canon EF 24-85mm is its aperture. The device boasts an aperture of f/3.5-4.5 which basically means that it’s pretty competent when it comes to taking shots in a variety of shooting situations. Like the first Canon lens on our list, it also uses an ultra-sonic motor which lets it focus much faster compared to other lenses. This becomes exceptionally convenient especially when you consider the fact that the lens is a zoom lens. Its ultra-sonic motor lets you focus the lens much faster compared to other zoom lenses, so you don’t need to wait too long for the device to search through the focal range during use. Features a 24-85mm focal range that allows it to function as more than just a telephoto, so you can get more out of your lens. Internal focusing mechanism means the lens doesn’t have to lengthen or shorten during use, which makes it less prone to damage. Uses an aspherical lens design to prevent the development of spherical distortion and aberration. EF mount means it’s compatible with a wide variety of Canon digital SLR cameras. Doesn’t produce the same sharpness and clarity that a prime lens would generate. Another popular third party brand that’s making leaps and bounds in the photography industry is Opteka. Offering some of the most affordable high quality accessories and lenses for well-known camera companies, this brand has earned itself a pretty solid following in the market. For our list of the best 85mm lens for Canon cameras, the Opteka 85mm f/1.8 Manual Focus Aspherical Medium Telephoto Lens seemed like a sound choice at number four. The device retails at just under 100 USD, which makes it the most affordable choice on our list. In fact, it’s probably the most affordable telephoto lens for Canon cameras all together, as most other choices would set you back thrice or four times that price. Despite being ultra budget-friendly though, the Opteka boasts some pretty solid features that make it perform like any other high quality telephoto. Some of the qualities that make this particular lens a worthy purchase include its all-metal body for durability, its 10 lens elements in 7 groups for outstanding bokeh quality, and its f/1.8 aperture that maximize lighting to give you beautifully lit images with minimal effort. It’s also worth mentioning that the Opteka 85mm is a manual focus lens so you may have to learn a few tricks to make the most of its design. But otherwise, it’s a solid choice that won’t give you an episode of buyer’s remorse any time soon. Comes at a super budget friendly price at just under 100 USD, saving you hundreds of dollars compared to more expensive lenses with the same capacity and quality. Compatible with a wide array of Canon lenses so you don’t need to worry about being able to use it for your extensive DSLR collection. Features 10 lens elements in 7 different groups, allowing the lens to generate beautiful out of focus areas. Despite being a budget lens, still produces high quality portraits that compete closely with more expensive, better known brands on the market. Not exactly the most durable lens, so it pays to be a little more careful when handling and using it. To complete our list of the best 85mm lens choices for Canon branded cameras, we’ve chosen the Canon 85mm f/1.4 IS USM DSLR Lens with IS Capability. This particular lens hasn’t had quite as many purchases as the other Canon lenses on our list. That’s mainly because it’s a lot more expensive, costing up to three times the price of many other, suitable choices. Despite the hefty price tag though, the lens does offer some pretty heavy functionality that makes it a solid choice if you’ve got the extra cash to spare. One of the main reasons why it’s such a great pick is its IS capability – a revolutionary technology that’s being propelled by the Canon brand. This image stabilization ability simply means that the lens itself reduces the chances of distortion, noise, and aberration. Other than that, it features high speed autofocus functionality, an apsherical lens, a dust and water resistant build, and exceptional sharpness and image clarity that make it a suitable investment if you’re willing to spend that much. Features IS capabilities that makes it very efficient at reducing noise and distortion, so image quality is significantly better. High speed autofocus lets you take that shot much faster, eliminating the chances of losing those split-second moments. Aspherical lens eliminates spherical aberration that occurs around the edges of images. Water and dust resistant construction keep the lens in perfect condition after years of use. The price tag might be a little too impractical for buyers who don’t have a lot to spare. A telephoto lens isn’t something any DSLR owner should be without. So what are you waiting for? 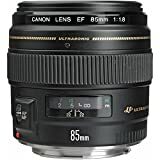 Make sure to buy nothing but the best 85mm lens for Canon cameras and give yourself the capability to take those picture perfect shots with each snap. To help you in your search, try checking out these 5 picks so you can land the ideal device minus the confusion. We hope this article has helped you find the best 85mm lens for Canon cameras.